A superior detached family home located in the quiet and tranquil hamlet of Camaghael. 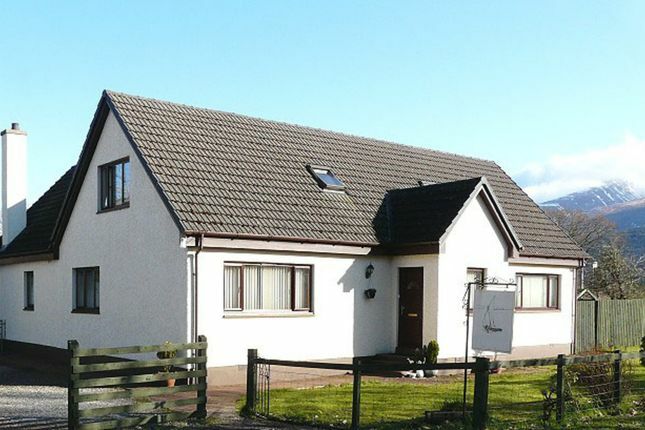 The property is surrounded by lovely West Highland Scenery and enjoys views towards The Great Glen, Ben Nevis, Aonach Mor and the River Lochy. There is an ambience of semi-rural living yet Camaghael is located just 3 miles outside of Fort William. Eishkin is a well presented and well maintained family home which benefits from extensive and deceptively spacious living accommodation, neutral dÃ©cor, oil fired heating, double glazing, quality fitted internal doors, ample storage, detached garage and self-contained annex. A noteable feature of the property is the covered veranda off the main bedroom with views towards the River Lochy and northwards over the Great Glen. An added benefit to this property is the large detached garage with self-contained annex above. With the relevant permissions the annex could generate a regular and viable income and is not currently liable to additional council tax. Camaghael is located 3 miles from Fort William Town Centre. Fort William is the main district town of Lochaber and known as the "Outdoor Capital of the UK." The town is a popular tourist destination and has a wide variety of tourist attractions including the Caledonian Canal, Ben Nevis, Glen Nevis, Nevis Range Ski and Mountain Bike Centre and the Great Glen and has developed an enviable reputation for providing all manner of outdoor pursuits including rock climbing, kayaking, skiing, hill walking, mountain biking and sailing to name but a few. There is a regular bus service linking Fort William to Camaghael. Accommodation: Entrance Porch, Inner Hallway, Lounge, Fitted Kitchen, Dining Room, Utility, Bathroom, Shower Room, Five bedrooms (One En-Suite with Veranda and two on the Ground Floor). Entrance porch: 2.29m x 1.1m (7'6" x 4'6") Window overlooks the front garden and the internal door with clear glass panels opens into the reception hallway. Reception hallway: 5.7m x 4.4m (18'10" x 14'5") Spacious reception hall with plenty of useable space. There is a large built-in storage cupboard with lighting, coat hooks and shelving. Access to the first floor via Newell and Post Staircase lounge: 6.4m x 5.2m (21'0" x 17'0") Spacious lounge with French Style doors which provide access to a patio area and garden grounds. There is wall lighting, a marble effect fireplace with matching hearth, solid fuel fire which can also serve the heating (currently closed off). Fitted kitchen: 4.3m x 3.2m (14'2" x 10'4") Rear facing, fitted kitchen enjoying views towards Ben Nevis. With a variety of wall, drawer and base units to include a corner carousel and display unit. There is tiled walls above the work surface areas, downlights and tile effect vinyl flooring. Utility room: 2.2m x 1.7m (7'3" x 5'7") Wall mounted units with marble effect work surface and matching splashback. Downlights and vinyl flooring. Dining room: 4.2m x 3.3m (13'8" x 10'9") Enjoying views towards Aonach Mor. The fitted storage and display unit is included in the sale. Wood effect laminate flooring. Bedroom 1: 4.8m x 3.3m (15'11" x 11") (ground floor) Lovely, bright front facing room. Built-in wardrobe with shelving and clothes rail. Bedroom 2: 4.9m x 3.1m (16'3" x 10'3") (ground floor) A well-proportioned room with built-in bedroom units with matching free standing cabinets which are included in the sale. Shower room: 6.9m x 2.2m (6'9" x 7'3") (ground floor) Corner shower unit with wet wall finish and Mira thermostatic mixer shower. Wash hand basin with tiled splashback, mirror, shaver point, extractor and heated towel rail. First floor bedroom 3: 4.5m x 4.2m (14'9" x 13'8") A spacious room enjoying views towards Ben Nevis, Aonach Mor and Glen Nevis. Built-in wardrobe with hanging rail and shelving. Bedroom 4: 3.6m x 3.4m (11'10" x 11'2") Another spacious room with two separate built-in cupboards, one with shelving and one with clothes rail. Bathroom: 2.6m x 2.7m (8'6" x 8'10") Fitted bath with traditional style taps and a detachable showerhead. Partially tiled walls, wash hand basin, bidet, and W.C. Shaver-point and mirror, built-in cupboard with shelving, spot light fitting and extractor fan. Bedroom 5 (master bedroom) & en-suite bathroom 6.3m x 5.3m (20'6" x 17'5") (at widest point) A beautiful, spacious room with built in wardrobes with hanging rails and shelving. French Style doors lead to a covered veranda where there are stunning views, north of the great glen and surrounding countryside as well as views over the garden towards the River Lochy where there are downlights and plenty of space to take breakfast or to sit and enjoy a glass of wine. En-suite Bathroom (2.6m x 1.9m (8'7" x 6'3") Heritage Jacuzzi bath with Micra electric shower with folding shower screen. Wall and floor tiling, heated towel rail, extractor fan, mirror and downlights. "the annex" A welcomed benefit of the Granny Annex is that it is not currently subject to additional council tax and comes under the cover of the main house. There is a service door to the flat which is located above the garage as well as a side entrance door enabling private access to the flat and garage. The annex benefits from a Combi Boiler and oil heater. The white goods in the ownership of the sellers are included in the sale. First floor accommodation has coombed ceilings and measurements are to the widest points. Lounge/kitchen 6.8m x 3.8m (22'4" x 12'6") There are windows to the front and side and internal staircase. The kitchen area has a variety of fitted units. Bedroom 3.8m x 2.9m (9'6" x 12'6") Window looking northwards to the great glen. Shower room Corner shower unit, wash hand basin and W.C. Externally Fenced garden grounds with gated access providing off street parking for several vehicles. Front and rear grounds are predominantly grass and patio and there is external lighting. There is a large single garage with up and over door, lighting, power supply, radiator serviced from the main house supply, plumbing connections and a workbench which is included in the sale price. Shed (formerly used as a dog kennel) with external and internal lighting and power supply. Further shed with wood store. Property descriptions and related information displayed on this page, with the exclusion of Running Costs data, are marketing materials provided by McIntyre & Company, and do not constitute property particulars. Please contact McIntyre & Company for full details and further information. The Running Costs data displayed on this page are provided by PrimeLocation to give an indication of potential running costs based on various data sources. PrimeLocation does not warrant or accept any responsibility for the accuracy or completeness of the property descriptions, related information or Running Costs data provided here.